I snorkeled. I got tanned, but not as bad as Bali (surprise, surprise). I ate. I bargained, albeit failed miserably at times. I ate again. I shopped like mad, NOT in shopping centres, nor retail outlets, but at 7-11 (yeah, LURVE their milk, Lay’s potato chips, cheap burgers/hot dogs, etc). I got mighty pleased with the friendly mannerism of the Thai people, though I am no farang. I ate again. I was appalled once touching down in LCCT, for the ultra rude taxi driver was more obnoxious than all the politicians combined. The bad ones, at least. But I got lethargic from all the travelling. The blistering heat was probably too much for Motormouth to handle. But I persevered, and I came back in one piece. And I got online. And then …. I decided, in a most devilish smirk, to present some of the most teasingly tantalizing shots of the foods that I devoured over in Krabi and Phuket of Thailand, over the last 6 days. Khao Jam. Khanom Jeen. Massaman. Fuji Japanese Restaurant. Sizzler’s. Swensen’s. Khao Pad. Khao Man Kai. Or I could be rambling way off my senses. 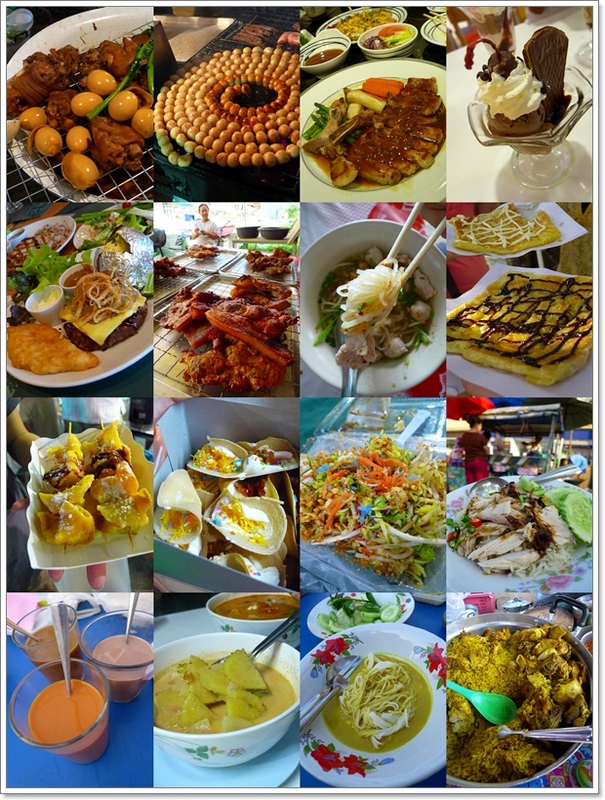 After all, I did not recognize most of the street foods I ate over in Krabi and Phuket. But really, who cares when they’re surrounding you, almost 24/7, and 365? Okay. Now …. I’ll see where to start off. You like the day by day account, ala Hanoi and Bali travelogues? OR, I might just post some highlights here and there, like the Bangkok foodhunt, or the more recent Malacca excursion? Hmmm ….. now for some well-deserved R&R ….. Zzzzzz. Feel free to send me an e-mail using this Contact Form, in case you have raging questions that need to be answered. I promise to assist in any way possible. 6 Days, 5 Nights in Krabi and Phuket in Thailand. And on a budget. Wanna know how I spent less than RM1000 for the whole journey? Read on. And come back for more ……. So many damn delicious thing to makan. :p War…only Rm1000 for 1 week stay? Please do it like day by day, it gonna be interesting!!! Btw, I’m having difficulties to see your pictures here… is it because they are big files? Most of the time, it’s very hard tosee the pictures in your blog because it takes a very long time. Like in this post, I can’t see the collage picture at all. I will pimp both you and Leo’s blog to the Tourism Authority of Thailand (TAT) for doing Krabi for doing such justice to Krabi with such an excellent review! yes. you is veli evil. everything looks sooooo good!! and all for only rm1k? coolness!! cant wait to read more about your trip. PS: i love the changing backgrounds. it’s fab! Oh, you are the devil! For presenting such delicious Thai food!! Yummy yum yum!! Now my heart itching for Krabi leh! very cool.. but we can do one week for less.. wanna know how? 😛 LOL .. great post j2kfm. keep it coming! wah very nice leh, must go to Krabi! I am tryin to comment for the 5th time!! hope tis on e gets thru! Whoops, anything wrong Becks? I realized that some have lamented about the lousy commenting system. Hmmmm …. anyone else facing the same problem? Drop me a message at the chatbox on the sidebar. Krabi. Phuket. Snorkeling. Getting tanned. And ALL. THAT. FOOD. RM1000 for 1 week stay? oh my, i’m planning my trip to krabi/phuket by end of this year.